Eric Henderson said it the other night at the Doug Coombs memorial party when he said that "this place is about the highest highs and the lowest lows." The other day I wrote about those lows that I was feeling and today was other side of that spectrum. We got some afternoon clearing and we were ready for it. When got bumps up to "Python" first run and it was a gem. A really great start to the trip. 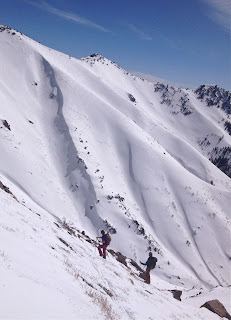 We skied pow all the way back down to the valley floor for another bump over to another zone. Andy the pilot made a solid stick on the landing and we were in to the next line up. Henderson was testing the slope when a good slide popped out and ran as quite as a mouse to the glacial floor in a spectacular smokey display. It was a bit eerie to watch. The crown ran down ridge a good thousand feet and averaged a foot to two feet deep. We were pretty washed out but we made the best of what was left. Tomorrow is looking good also. If we have a full day like this afternoon we could really get it done. So this is the high and I am soaking it in as best as I can.